When a light buggy wheel is to be set mistakes are often made in measuring the wheel. The wheel is too light in itself to resist the pressure of the gauge. The smith tries to go it light and if there is not the same pressure in measuring the tire there was in measuring the wheel, it will not give the same results; and when the tire is put on it is either too tight or too loose. I worked for many years on a tool to hold the tire steady in order to overcome this trouble. The only device that I have ever seen for this purpose before is the anvil close up to the forge, one side of the tire on the forge, the other on the anvil. This arrangement would crowd the smith, roast his back and expose him to ridicule, but it will not help to ruin the tire. The tool I invented is a tire holder made of cast iron. It consists of a standard or frame with a shank in to fit in the square hole in the anvil; in the standard is a slot hole from the bottom up. On the back of the standard are cogs on both sides of the slot hole. Through this goes a clutch hub with cogs in to correspond with the cogs in the standard. On the outside of the standard is an eccentric lever. Through this lever is a tapered hole to fit over the clutch hub. This lever is tapered so that it will fit different thicknesses, while the cogs and eccentric lever will adjust it to different widths. This device is so cheap that any smith can afford to have it. Next time you buy a quart of whisky sit down and figure out which will do you more good, my tire holder or the whisky. 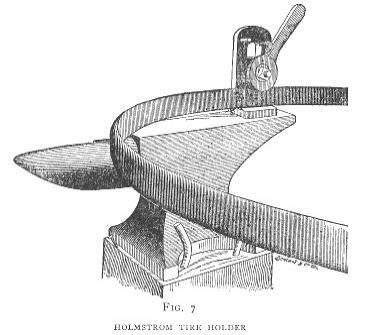 Figure 7 is an illustration of my holder. This tool is better than an advertisement in your local paper, of which the following story will convince you. A blacksmith in a prohibition county in a northern Iowa town got into the habit of going over to a Minnesota town for a keg of beer every month. On one of his periodical visits to this place he saw a crowd of men standing around a road grader in the road. As he approached he found that the grader had a serious break-down and the men were just discussing the possibilities of getting the grader repaired in the village shops. One said no smith could do it, another thought they could if they only had tools. "I know a man," said one in the party, "that can if any man can, and he has tools I am sure. I was over to his shop the other day to have my buggy wheel set, and mind you, he had the slickest tool you ever saw to hold the tire in; I never saw a tool like that before." "Well," said one, "that has nothing to do with this case. "Yes it has," said the road boss, "my father always used to say, 'A mechanic is known by the tools he uses,' and when a smith has good tools in one line, he has them in another, and I shall give this man a chance."